Are decorative driveways on your list of goals for 2019? December is a month of reflection and planning amongst all the festivities. Whether you are an individual making plans to upgrade your driveway, or a property developer with an estate of new builds in the planning stages; NatraTex has leading edge materials to create a fantastic approach to your home or properties. You may be tempted to go with resin bound surfacing, but we have developed a superior synthetically bound aggregate which excels on aesthetics and performance. Decorative driveways create a “wow factor” and that all important first impression. If you are a business, the exterior of your premises is the first aspect of your organisation which customers experience. 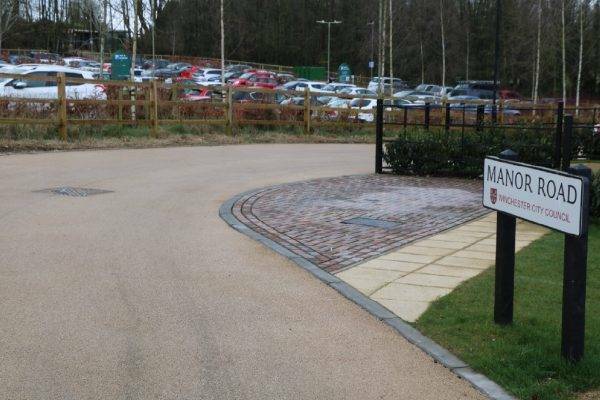 They will assume about the quality of the goods and services you provide, so surfacing the approach, car park and entrance with a high specification material is an important element of the customer journey. NatraTex has a broad colour palette to choose from, so we can supply coloured surfacing to match your branding and reflect your business. Our retail clients include Next, Aldi and Waitrose. When someone is looking to buy a home, first impressions count, and minds can be made up very quickly! Therefore, getting the surfacing of decorative driveways right is imperative. Having a stylish drive and pathways when someone drives up to a property and steps out of a vehicle can be a big influence before they’ve even set foot through the front door. Whether this applies to a street of new properties from a commercial developer or an individual putting their home on the market, the same principle applies. NatraTex has a proven record in supplying surfacing materials which combine a great looking finish with lasting durability to residential developments around the country. The clear synthetic binder allows the colours and tone of the aggregates to shine through. Whether it is a welcoming Cotswold stone or a warmer and deeper hued terracotta, or a more neutral grey. NatraTex surfacing for decorative driveways has been developed and used in residential and business settings around the UK. To find out more, please contact us.